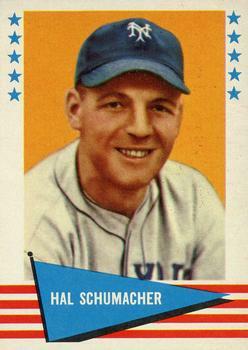 Pitcher Hal Schumacher spent his entire major league career with the New York Giants, and played a key role for a team that won three pennants in five seasons. Carl Hubbell was the alliterative King Carl, while Hal Schumacher was Prince Hal. The Giants of the 1930s and early 1940s also included Hall of Famers Mel Ott and Bill Terry. Harold Henry Schumacher ("SHOO-mocker") was born on November 23, 1910, in Hinckley, New York. Hinckley, in Herkimer County, rests on the southern edge of the Adirondack Mountains, about 20 miles north of Utica. Harold was the youngest of nine children born to Andrew (Andreas) Schumacher and Margaret (Magdalena) (Anstett) Schumacher, and only the third one born in the United States. Andrew had emigrated from Merzalben, Germany, to Hinckley in 1903, and Margaret followed in 1905. By 1913 the family had settled in the village of Dolgeville, (pronounced "DAWLJ-vil"), about 25 miles east of Hinckley and also nestled in the foothills of the Adirondacks. Andrew was a shoe laster at the thriving Daniel Green slipper manufacturing company in Dolgeville, and he eventually secured for himself and his family a cozy home atop a small hill on the banks of the East Canada Creek. Harold's eldest brother Joseph, who was born on November 10, 1889 in Germany, was already a young adult of 21 by the time Harold came into the household. The rest of the family consisted of Christian (born July 4, 1891); Katherine (born December 17, 1893); Herman (born January 21, 1896); Johanna Barbara (born December 4, 1898); Adolf Andrew (born December 27, 1902); Lena (born April 28, 1906); and Helena Franziska (born June 26, 1908). Harold rounded out this hard-working, devoutly Catholic family. If a word could describe Hal Schumacher, it would be "achiever." He was a very good student and an exceptional athlete by the time he reached high school. He played baseball and basketball, and was so valued on the field that he doubled as a pitcher and a shortstop. He also played for the Dolgeville town team, called the Spofford Hose Company team, and the Little Falls Independents, a semi-pro team in nearby Little Falls, where major league scouts first raised their eyebrows at what they saw and heard about this Dolgeville athlete. Although Schumacher was only 15, his manager in Little Falls, Charlie Fitzgerald, was proud of his protégé, and soon the Yankees, the Cardinals and the Giants all had their eyes fixed on young Harold Schumacher. But Hal was intent on getting a college education. After graduation from Dolgeville High in 1928, Hal was accepted at Saint Lawrence University in Canton, New York. Here again, he performed well both scholastically and athletically, as a star in baseball, football and basketball. Bill Reid, graduate manager at Colgate University, stated in the Little Falls Evening Times, "He is the best all-around athlete in Central New York." In 1931 former Giant third baseman Art Devlin, now a scout for John J. McGraw's Giants, offered Schumacher his first baseball contract. "Don't forget, that was in Depression days," Schumacher said later. "I had to leave school because I didn't have enough money to finish school." He signed with the stipulation that the Giants would let him complete his college education. The tall right-hander was said to remind McGraw of his favorite pitcher, Christy Mathewson. Schumacher told author Peter Williams, "McGraw, I think, did have a soft spot in his heart for me." On April 15, 1931, McGraw started the youngster in the second game of the season. He escaped the first inning against the hard-hitting Philadelphia Phillies with only one run scored, but he did not get out of the second. The Phillies scored eight times en route to a 10-7 victory. When asked why he would start the rookie so early in the year, McGraw answered, "Because Schumacher happens to be that sort of lad...he is also a lad who is not perturbed by taking a beating." While Hal took his beating, he displayed his maturity by looking forward rather than back: "It does feel a little different from pitching to college batters ... but I hope Mr. McGraw gives me another chance soon. I know things will be different then." After spending time with Bridgeport, Connecticut, of the Eastern League, and Rochester, New York, of the International League, he returned to the Giants roster on September 7. McGraw gave him one more start in the next-to-last game of the season. The 20-year-old posted his first big league victory, beating the Cubs 15-7. In eight games his ERA was a painful 10.80. He struck out 11 in 18 1/3 innings, but walked 14. Then he returned to St. Lawrence to continue his education. McGraw put the 21-year-old college senior in the starting rotation at the beginning of the 1932 season. But the legendary manager lasted only 40 games. On June 2 he resigned, with the Giants in last place. The new manager was first baseman Bill Terry. Although he had befriended Schumacher and roomed with him on the road, Terry removed him from the rotation in the second half of the season. Schumacher started 13 games, winning 5 and losing 6 with an ERA of 3.55. In 101 1/3 innings he walked 39 and struck out 38. He was perfecting his sinker, mixing it with a good curve and a decent fastball, and his improvement on the mound did not go unnoticed. Years later Schumacher told Peter Williams, "I always think of the Giants in terms of 1933 -- and naturally, '36 and '37, we won pennants then too -- but for me, the '33 season is the New York Giants." Terry went with young players, including Schumacher and another unproven right-hander, Roy Parmelee. The Giants were in first place on June 12, graduation day at St. Lawrence University. In the midst of a pennant race, Terry took virtually the entire team far north to Canton to watch as Schumacher received his diploma. After the ceremony the Giants played an exhibition game against the university team. Schumacher pitched the first two innings, allowing only one hit to his old teammates. The Giants won, 12-4. As the Giants won their first pennant since 1924, Schumacher was the number-two pitcher behind Carl Hubbell. Hubbell won 23 games, posted a 1.60 ERA, and was named the N.L. 's Most Valuable Player. Schumacher won 19 games, seven of them shutouts, losing 12, and his 2.16 ERA was third best in the league. He completed 21 of 33 starts, striking out 96 while walking 84. He was named to the National League team for the first All-Star Game ever played. The Giants faced Washington in the World Series. After Hubbell won the first game, Schumacher started Game Two and held the Senators to five hits in a 6-1 victory. The Giants led three games to one when he got the ball again in Game Five, with a chance to clinch the championship. He was relieved in the sixth with the score tied at three. New York won on Mel Ott's tenth-inning homer. Besides allowing just four runs in 14 2/3 innings in the 1933 World Series, Schumacher hit .286 and drove in 3 runs. The 1934 Giants won 93 games, but a late-season slump kept them from winning the pennant. Schumacher turned in a sparkling 23-10 record and a 3.18 ERA in a career-high 297 innings. He also hit six home runs, a National League record for a pitcher (since surpassed), and added five doubles, a triple and 15 RBIs, with a .239 average. Schumacher held out for a raise to $10,000, but the Giants offered only $9,500. Terry promised to put up the other $500 personally if the pitcher had a good year. Schumacher would make his manager pay off. Early in the season Prince Hal faced the aging Babe Ruth for the only time. Ruth, finishing his career with the Boston Braves, went down on strikes. Schumacher pitched in his only All-Star Game, holding the American Leaguers to one run in four innings, while walking one and striking out five. He finished with a 19-9 record and 2.89 ERA, third best in the league. At age 24 he had established himself as one of the premier pitchers in the National League. On February 1, 1936, Schumacher wed his high school sweetheart, Alice Clifford Sullivan, a pretty, blue-eyed brunette who had graduated from Elmira College in 1934. They were married in a small ceremony at St. Joseph's Church in Dolgeville. W. Arnold Petrie, Hal's best friend, served as best man. The couple honeymooned in Miami before they traveled to the Giants' training camp in Pensacola. The Giants won another pennant in 1936, but Schumacher was troubled by a sore arm most of the season. He went 11-13 with a 3.47 ERA. In the second game of the World Series, the Yankees touched him for five runs in two-plus innings, and went on to win, 18-4. Schumacher called the fifth game of the series the "best ballgame I ever pitched in my life." With the bases loaded in the third, he struck out Joe DiMaggio and Lou Gehrig and got Bill Dickey to pop up. He went all the way, striking out 10, as the Giants won in 10 innings, 5-4. The Yankees ended the Series the next day, claiming the first of four straight titles. Schumacher got one more chance at the World Series in 1937, starting and losing Game Three as the Yankees beat the Giants again. It may be that his early workload caught up with him -- he pitched 937 1/3 big league innings before his 25th birthday. For whatever reason, after age 25 he never again won more than 13 games in a season, while completing fewer starts. He was an above-average pitcher, but no longer the star that he had been. After the 1942 season Schumacher joined the U.S. Navy, and served as a lieutenant aboard the 512-foot aircraft carrier Cape Esperance. When the war ended, he returned to the Giants in 1946. At age 35, he started just 13 games and appeared in only 24, with a 4-4 record. He retired from baseball with a 158-121 record and 3.36 ERA, and headed home to Dolgeville. McLaughlin-Millard, Inc., of Dolgeville, later to become the Adirondack Bat Company, and then Rawlings Adirondack, produced major league-quality bats (and bowling pins). The company could put a former major leaguer to good use, and his college degree in business and psychology could be used to best advantage. Schumacher was hired as vice president in charge of sales in 1946. His job included visiting spring training camps touting the company's bats. Willie Mays, Mike Schmidt, Reggie Jackson, Roberto Clemente and Willie McCovey used Adirondack bats exclusively; Bobby Thomson hit his "shot heard 'round the world" with an Adirondack. Schumacher stayed with the company for more than 20 years, earning a promotion to executive vice president in 1963. He also served one year as national president of the Athletic Goods Manufacturers Association. In 1967 he retired from Adirondack, and went to work for the national Little League headquarters in Williamsport, Pennsylvania, organizing instructional programs. Hal and Alice adopted two children, William and Mary. By all accounts, the family was very close, and was well liked by folks in Dolgeville and the surrounding communities. One acquaintance, Marie Kiesel, said, "Don't bother trying to dig up any dirt on this family, 'cause there isn't any." Although he never cared much for hunting or fishing, he bought a summer home on Canada Lake, not far from Dolgeville. He enjoyed playing golf after his retirement, and would sometimes break 70. He was, after all, an achiever. Schumacher often said that he simply had been blessed with a special gift, but those who knew him well considered him a humble man, never pretentious. Hal Schumacher was admitted to the Mary Imogene Bassett Hospital in Cooperstown, New York, in the spring of 1993 upon his return from wintering in Florida. He died of stomach cancer on April 21 at the age of 82. The prince of pitchers is buried in St. Joseph's Cemetery in his home town of Dolgeville. Charlie Fox, former ML catcher, interviewed by Ralph Tyko. Little Falls, New York, Evening Times, various dates. The Sporting News, various dates.